Although the Midwest is known more for its flat prairies than hilly regions, there's still plenty of good hiking to be found there. What the region lacks in altitude, it makes up for in natural beauty, including sparkling lakes, hidden waterfalls, sandstone canyons, and more. Whether you're looking for a short day hike or a remote backpacking trail, we've put together the best options for strapping on your boots and seeing what the Midwest has to offer. This 1,000 mile-long trail runs around along the border of an Ice Age era glacier that once covered much of Wisconsin. You can follow the trail through several of the state's most famous natural areas, including the gorges of Interstate State Park, the hills of Kettle Moraine State Forest, and the scenic river bluffs of the state's Driftless Area. There's no need to limit your hiking to the warmer months; the Ice Age trail is a favorite destination for snowshoeing and cross country skiing. Located just 90 minutes from Chicago, this state park also owes its good looks to an ancient melted glacier. As the glacier receeded, it caused a torrential flood which carved the park's signature sandstone canyons. You can find flowing waterfalls in 14 of Starved Rock's 18 canyons. While the best time to see the waterfalls is in the spring and early summer, if you decide to brave the park in winter, you might be lucky enough to see a frozen ice fall. Winding through the highlands of the Ozark Mountains, the Ozark Trail has some of the most varied hiking in the Midwest. From densely wooded forest to steep bluffs and picturesque streams and rivers, there is an opportunity for every kind of hiker. We recommended checking out the Taum Sauk section of the trail. This 35-mile stretch features Missouri's highest waterfall, naturally formed swimming pools, billion-year-old igneous rock formations, and scenic vistas of the Ozarks. Once a polluted dumping ground, during the past 40 years, the Cuyahoga Valley National Park has been restored back to its natural beauty. The 125 miles of trail runs through wetlands, rolling hills, creek crossings, and shale cliffs. Keep your eye out for wildlife: the park is home to beavers and river otters, as well as home to two blue heron santuaries. This remote island located in the northwest corner of Lake Superior is also a National Park. 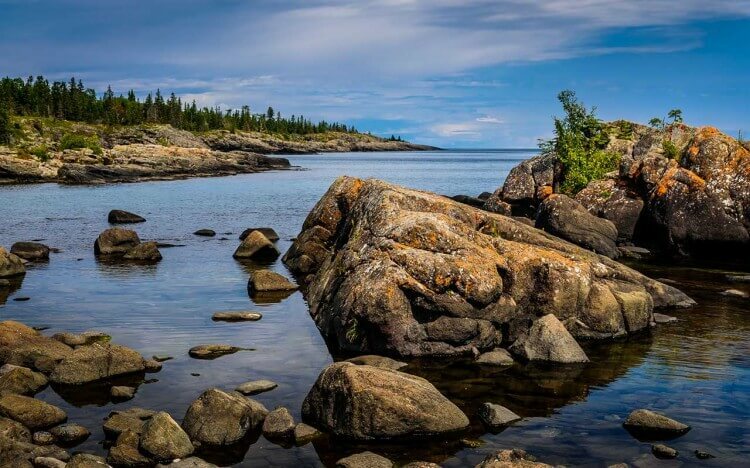 Although it's only accessible by boat or sea plane, Isle Royale is actually one of the most re-visited National Parks in the U.S. Home to more than 100 miles of hiking trails, the landscape features rocky bluffs, evergreen forests, and beautiful views of Lake Superior. You might even spot a moose or two if you're lucky.